Here are a couple of shots of my Ware 'Music Master" This is the only radio in my fleet that uses UV-199 tubes, with the exception of my Radiola III and IIIA, everything else uses 01A's. Currently un-restored, all the wire have cracked insulation, and both transformers are open. No plans to restore at the moment. The Radiola III and IIIA didn't use 199s, they used WD11s. Radiola III, IIIA, III amp can and did use ux-99's with RCA "blessing". RCA Service notes for 1923-1928. This is the "other" "Redbook" series, the most commonly referenced is the Service Letters. The Service Notes are actual copies of the instructions provided with the set and to dealers files. It is the most comprehensive information for all RCA. It is a huge download of 653 pages as indicated on most pdf browsers. On page 48 (pdf) begins the complete information on the Radiola III, IIIA, III amp as well as complete instructions how to convert to ux-99's by two methods. BUT they were made to use WD-11s. Ron, that was poor wording on my part, did not mean to imply that the Radiola’s used them. Chas, as it turns out my IIIA has adapters with UX 199’s in it. 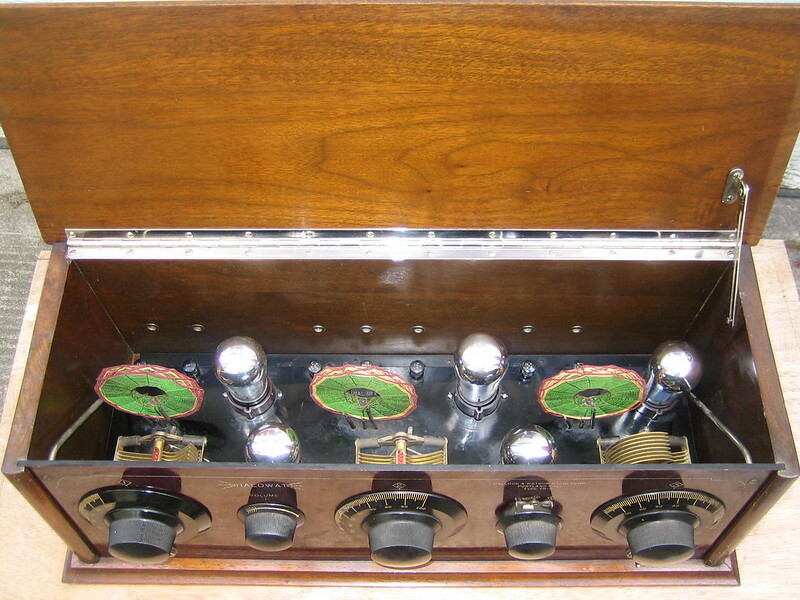 Here is a seldom seen 1922 1-tube set by Victor Radio Corp. Here is another interesting set from an obscure manufacturer. 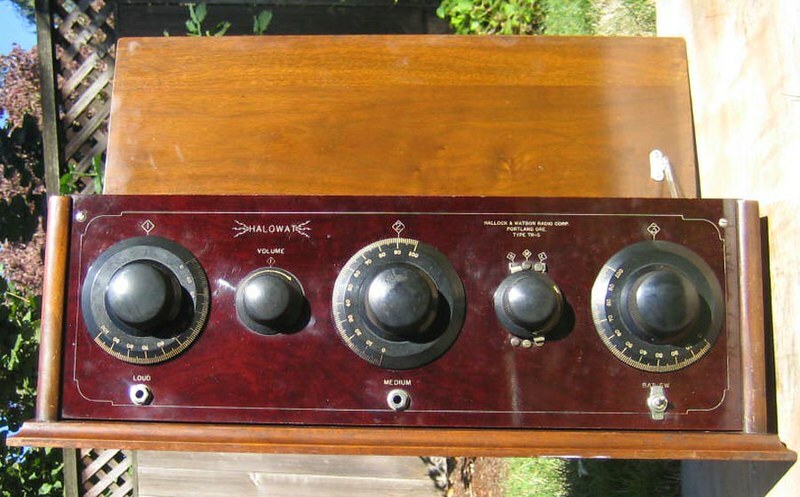 A Crouch, Wilson & Company Clar-A-Dyne receiver. I have seen ads for the Victor, Alan - Probably in "The Radio Dealer". This is a somewhat obscure Neon Simplex one tube receiver from 1923. The Neon Lamp Works of New York City made a brief foray in to manufacturing radios beginning in August 1923 as advertised in "The Radio Dealer" Neon Lamp Works exhibited at the Second Radio Exhibition at the Grand Central Palace for a week beginning in October 1923. Later ads in "The Wireless Age" and "Radio News" showed a matching amplifier and accessories. Toward the end of 1923 they became or sold out to Royal Manufacturing Co. also in NY. They continued the Simplex line which soon became the "Royal" line. I would be happy to take the Amplifier off someone's hands as a gift! makes not all that early since 199s came out in '25. he told me he built it as a class project at MIT in 1922.
and talk... I'd really like to know his name. tubes he bought when he built the set. in the auction at last March's Charlotte meet. allows the user to select either crystal or tube detector. My Giblin Model RL and associated accessories and memorabilia. File comment: Giblin RL with loop antenna and Music Master horn speaker. This is one of my recent acquisitions. This is a one tube set with a two tube amp made or marketed by The American Radio Sales and Service Company of Mansfield, Ohio from around 1922 or 3. I have seen ads of this company but no mention of this radio or the amp. It looks to be in the original state. Anyone have any information on this company? Very nice radio. Probably the only one in the US. The French collectors I spoke with said that there was another one in France. The Halowat of mine is the only one I have seen in person so I guess having been made here in Portland that makes it somewhat rare. Last edited by Chas on Dec Mon 04, 2017 2:51 pm, edited 1 time in total. And as usual the Hedgehog transformers are open in all four quarters. I need one of those Russ, even if I have to make it myself!! The AK 50 has several layers of metal covers mainly for extreme shielding. Any missing cover will make the 50 a lousy radio with heterodyning against powerful stations. The circuit is a non-amplified high Q tuned filter on the input. It had a group of transformers and amplifiers that failed frequently.